One of the many things I love about my job is the variety of things I get to do. I spend most of my day in front of a computer working on wood floor design, marketing and sales tools for the products we manufacture. But on occasion I spend time in the Ozark hills, twenty minutes east of the middle of nowhere, watching the natural beginnings of our production process at little “mom and pop” sawmills. These small operations dot the countryside and provide a living to countless families. In this post, I’ll take you inside one of those small operations and give you a glimpse of the meticulous detail that goes into cutting walnut lumber to be used in wood flooring. Above left: Select & Better grade walnut engineered flooring exhibits consistent color tone and a very limited amount of knots and other character marks. Above right: Character grade walnut engineered flooring includes color variation from dark brown to light creamy white, knots, peck (peck is named for the marks caused by woodpeckers), pith (the black streak formed at the heart of a log) and other natural characteristics of the lumber. This week’s hardwood floor of the week showcased a natural grade walnut floor. In that post I included a picture of some freshly cut walnut logs to show the creamy white sapwood of the tree just below the bark. To give you an even better idea of some of the process that takes place from forest to floor I shot a few short videos to share. In this first video, you’ll see a small band-saw mill cutting into a large walnut log. At the outset you can see the creamy white sap layer in the log and a swatch of the dark brown heartwood peeking through. The saw cuts an 8/4 (referred to as eight-quarter, which essentially means 8 – 1/4″ measurements and is roughly 2″ thick) board and then slides it off onto the sled. It is then moved to the edger where the mechanic is looking at each individual board and carefully trying trim in such a way as to optimize the amount of dark heartwood gleaned from each cutting. This is painstakingly slow work but it does ensure good color selection. This video will help you understand why we have to work with 25 different little sawmills to come up with enough lumber for our production. In this second video you’ll see the guys examining a board after it has been run through the edger. They are looking for color and defects and then sorting the boards into different grades of material to make different products. Those different grades of lumber go into production to get different types of flooring products. For example, below is a 7″ engineered walnut floor that was produced from walnut lumber that had a mix of all different grades of lumber. So you see it has some dark brown, clean consistent boards along with some boards with color variation in the individual plank, knots and other natural characteristics. 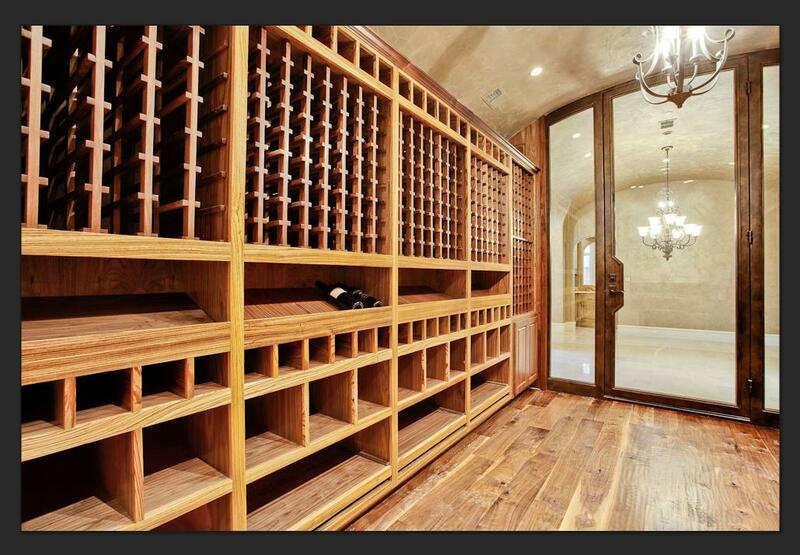 These 7″ natural grade engineered walnut floors from Real Wood Floors grace the wine cellar in a Philip Jennings Custom Homebuilders project in Dallas, Texas. The floor seen below was made from all consistently dark, clean walnut lumber that exhibits very little character markings or variation. Both floors provide breathtaking visuals in each setting. 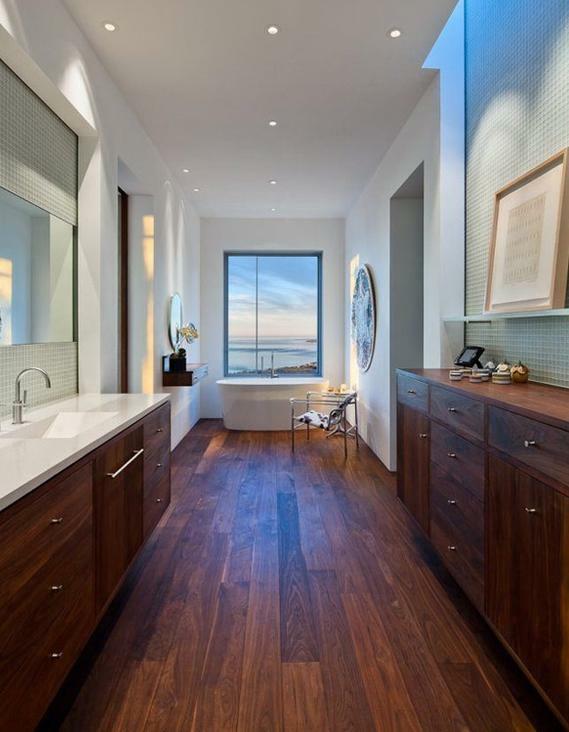 These select grade walnut floors from a freshome.com post steals the show in this setting. Wide and long planks show all the true character of the timber and provide a striking visual to this interior. Thanks for reading Skip. Let us know if you have any questions about the products we make or wood floors in general. Margret work up the motivation to re-post, I’d love to hear what you had to say. Are you in the flooring industry? What do you do?